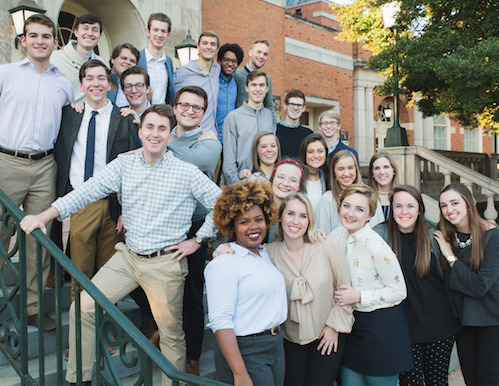 WAE (pronounced “way”), Samford University’s new Worship Arts Ensemble, will host their premier Night of Worship Nov. 16 at 7 p.m. in Brock Recital Hall. Admission is free, but seating will be limited. The ensemble will commission new works to perform, including a piece by music faculty member Joel Davis for the inaugural concert. “WAE wants to foster fellowship and worship opportunities across Samford and in our community while introducing the church to new concepts and tools for worship,” notes Mathis. It is an innovative ensemble that will reach well beyond the boundaries of the School of the Arts and Samford. WAE will perform and lead worship in churches and venues across our community, in lower socio-economic areas, and in global mission projects. Mathis added that the School of the Arts is home to many organizations and groups that engage students from across the campus including theatre productions, Dance Company, A Cappella Choir, Marching Bulldogs, Campus Worship, and now the Worship Arts Ensemble which developed under the Center for Worship and the Arts. The next performance will be in the spring and help celebrate the 5th anniversary of the Center for Worship and the Arts.